Yes, you read that correctly! 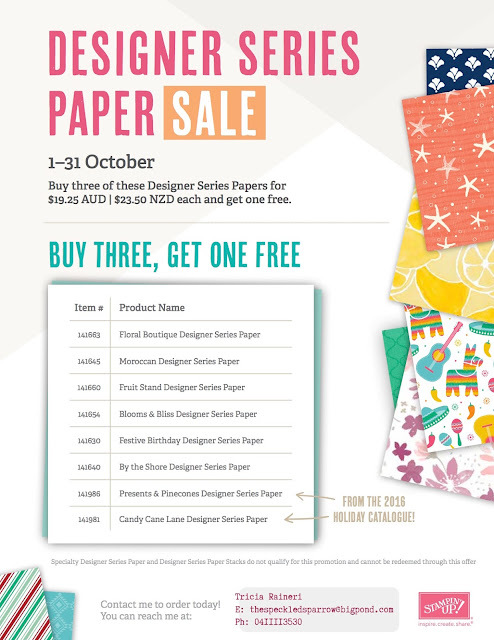 Between 1-31 October you can buy three packages of Designer Series Paper and get one free! That’s great news since everyone can use more Designer Series Paper. Here is a list of the DSP you can order. Remember you don't have to order 3 of the same DSP. You can order 3 different DSP packs & get a different one free again. What a great way to increase your stash of DSP or order enough DSP to make all your Christmas cards at once! Cut a variety of different strips & punch the ends using the triple banner punch. Stamp a greeting & add a ribbon for a quick, attractive card that shows off any DSP. Create a "window" on your DSP using framelits or a circle punch, then layer an image or greeting underneath. Try this template with several papers from the same collection & get a different look every time. Why throw away scraps when they are this pretty? Instead, use them up on this great card design. It's like a sampler of DSP. Use designs from one collection or mix & match for more possibilities. If you would like to order, you can click through to my store by clicking on the pictures below.